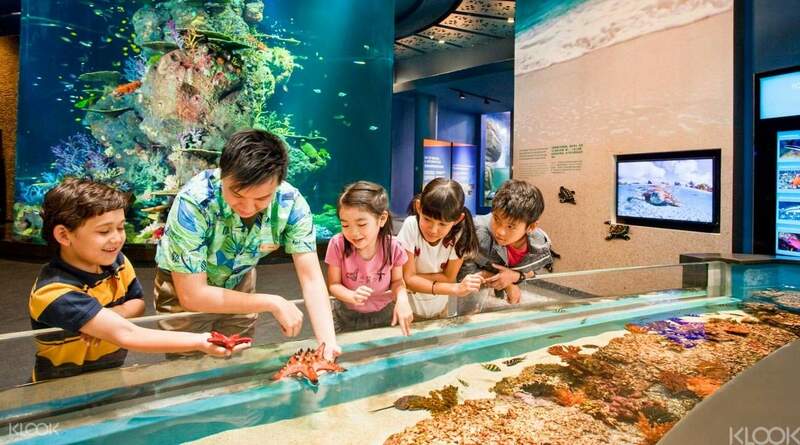 See a breathtaking underwater realm of over 100,000 marine creatures, from over 800 species across 49 habitats! As the largest aquarium in Southeast Asia, see big ocean viewing windows and the world's largest underwater acrylic dome at 9m in diameter! Explore the seas, travel through time, and join renowned seafarers along their journey in the Maritime Experiential Museum! Venture through the fascinating world beneath the sea as you explore the ocean realm of S.E.A. 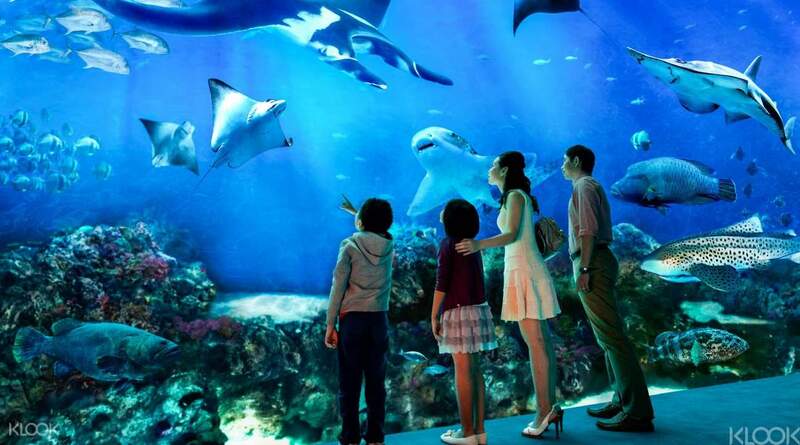 Aquarium Singapore, home to more than 100,000 marine animals of over 800 species, across 49 different habitats, each one as fascinating as the next. Get acquainted with the marine habitat as you meet magnificent hammerhead sharks, come face-to-face with bottlenose dolphins, discover sea life up close at the Touch Pool and watch the colorful fish, rays and sharks surround you in the panoramic Open Ocean. As South East Asia's largest aquarium, an awe-inspiring experience awaits as you unfold the endless wonders of our blue planet. Buy your S.E.A. Aquarium ticket at Klook and enjoy great discounts! Buying tickets using klook removed the need for us to queue to buy tickets. It was a very pleasant experience to see the different marine life available in this activity. These wonders will bring delight to both kids and adults. So many marine life that i was able to see first time here. Walking around at our own pace gave us the opportunity to enjoy this event better. Buying tickets using klook removed the need for us to queue to buy tickets. It was a very pleasant experience to see the different marine life available in this activity. These wonders will bring delight to both kids and adults. So many marine life that i was able to see first time here. Walking around at our own pace gave us the opportunity to enjoy this event better. The booking with klook was recognized immediately in the entrance and we were attended and entertained by the staffs. Our singapore experience (sentosa attractions like universal studios,sea aquarium and cable car is highly recommended to be booked) was hassle free and better with klook! Kudos to the developer! Keep up the good work! Thank you. Looking forward to our next travel and booking! The booking with klook was recognized immediately in the entrance and we were attended and entertained by the staffs. Our singapore experience (sentosa attractions like universal studios,sea aquarium and cable car is highly recommended to be booked) was hassle free and better with klook! Kudos to the developer! Keep up the good work! Thank you. Looking forward to our next travel and booking! The kids had a blast at the SEA Aquarium! They really enjoyed all the exhibits & the location was really convenient..right next to Singapore Universal Studios. The voucher was also the ticket so we just went straight to the entrance..no need to exchange the voucher at the ticket stand. The kids had a blast at the SEA Aquarium! They really enjoyed all the exhibits & the location was really convenient..right next to Singapore Universal Studios. The voucher was also the ticket so we just went straight to the entrance..no need to exchange the voucher at the ticket stand. It was an amazing experienced with my son, He enjoyed it a lot even me. We saw a lot of sea creature that most of them we've haven't see yet. We'll surely recommend it to our friends and family to visit. love love love for klook for saving time,money,and effort.. It was an amazing experienced with my son, He enjoyed it a lot even me. We saw a lot of sea creature that most of them we've haven't see yet. We'll surely recommend it to our friends and family to visit. love love love for klook for saving time,money,and effort..
it was a wonderful experience to be able to witness different species of marine animals. it was just sad that the open ocean feeding was cancelled due to bad weather. 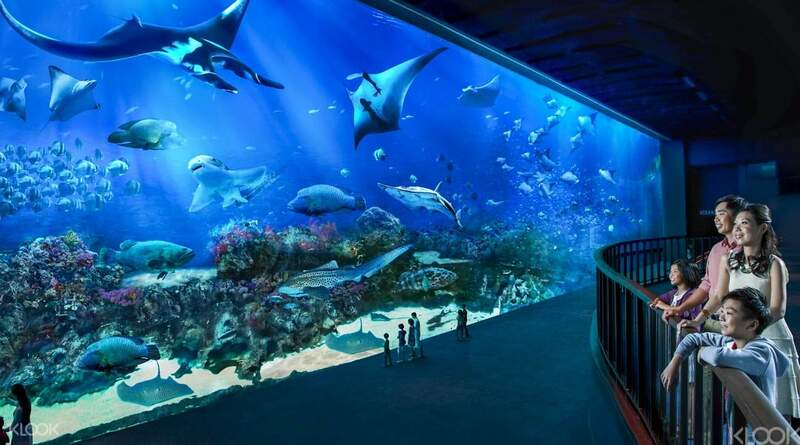 the aquariums were well-kept and the sea animals look healthy and safe. thank you for the wonderful experience! it was a wonderful experience to be able to witness different species of marine animals. it was just sad that the open ocean feeding was cancelled due to bad weather. the aquariums were well-kept and the sea animals look healthy and safe. thank you for the wonderful experience! Experiencing the marine life was truly amazing. yes! booking ising klook is the easiest way for you to skip the line just present your voucher printed or even using your device. The activity is 100% relaxing and exciting. In addition it is educational. Experiencing the marine life was truly amazing. yes! booking ising klook is the easiest way for you to skip the line just present your voucher printed or even using your device. The activity is 100% relaxing and exciting. In addition it is educational. great experience of visiting the sea aquarium as this house all the species of fishes jelly to elephants fish one can think of. Really a must visit for all. Moreover with klook it was very easy as the online voucher was just purchased 15 min before entering and the same was flashed at the entry. so no hassle of physical tickets. great job by klook to make life easier of travellers . great experience of visiting the sea aquarium as this house all the species of fishes jelly to elephants fish one can think of. Really a must visit for all. Moreover with klook it was very easy as the online voucher was just purchased 15 min before entering and the same was flashed at the entry. so no hassle of physical tickets. great job by klook to make life easier of travellers . Fantastic aquarium! No need to line up thanks to Klook! The manta rays were something to behold and generally the park was very well kept. Be prepared for crowds during the weekend, I suggest going as early as possible. Fantastic aquarium! No need to line up thanks to Klook! The manta rays were something to behold and generally the park was very well kept. Be prepared for crowds during the weekend, I suggest going as early as possible. A short trip on a weekend evening.. Just like other Singapore attractions, this is a perfect place to learn about marine life, the bio diversity and how we can start helping in conservation. The corals were beautiful, so we're the fishes. A must go place if one needs to go with the family and kids. This is a photographers delight too, but photographers better go at lean times as the place will be crowded on weekends. Need to carry a large aperture /fast lens for the great clicks. Learning experience on marine life as a whole. A short trip on a weekend evening.. Just like other Singapore attractions, this is a perfect place to learn about marine life, the bio diversity and how we can start helping in conservation. The corals were beautiful, so we're the fishes. A must go place if one needs to go with the family and kids. This is a photographers delight too, but photographers better go at lean times as the place will be crowded on weekends. Need to carry a large aperture /fast lens for the great clicks. Learning experience on marine life as a whole. A: Unlike third party platforms who may hold fraudulent tickets, Klook is an authorized reseller of S.E.A. Aquarium. All tickets sold by Klook are genuine and will be accepted at the admission gate.